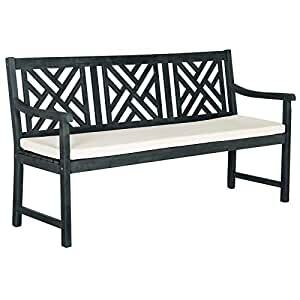 Lend a touch of casual elegance to your outdoor ensemble with this beautiful garden bench. The perfect finishing touch for any aesthetic, it is crafted from acacia wood and features a polyester fabric seat cushion. This lovely 3-seat garden bench also showcases a traditional silhouette, openwork design, and neutral finish for a cottage-inspired look. Try setting it on your front porch for the perfect place to enjoy after-work drinks with a friend or finish your latest read. Then, pair it with a glossy white garden stool, paper lantern string lights, and a verdant succulent for a country meets modern look. Expecting visitors? Add this lovely bench to your back patio seating ensemble instead to add convenient seating and a touch of refined style. If you want to liven up the look, you can also add a shimmering golden coffee table and sequined throw pillows for a bold and elegant arrangement. Overall 34.7” H x 60.6” W x 23.4” D. Seat 16.14” H x 44.5” W x 18.1” D. Overall Product Weight 76.2 lb. Lend a touch of casual elegance to your outdoor ensemble with this beautiful garden bench. The perfect finishing touch for any aesthetic, it is crafted from acacia wood and features a polyester fabric seat cushion. This lovely 3-seat garden bench also showcases a traditional silhouette, openwork design, and neutral finish for a cottage-inspired look. Try setting it on your front porch for the perfect place to enjoy after-work drinks with a friend or finish your latest read. Then, pair it with a glossy white garden stool, paper lantern string lights, and a verdant succulent for a country meets modern look. Expecting visitors? Add this lovely bench to your back patio seating ensemble instead to add convenient seating and a touch of refined style. If you want to liven up the look, you can also add a shimmering golden coffee table and sequined throw pillows for a bold and elegant arrangement.